This highly versatile liquid calcium product containing Solu-Plus, can be applied 3 different ways. Apply as an efficient foliar spray that can be readily absorbed. Apply to the soil prior to flushing to improve the ability to “Bump” sodium off negative charged exchange sites and put back in the soil solution, so with good water movement, accumulated sodium can be leached or flushed out of the root zone. Apply after rains or deep watering to replenish soluble Calcium, optimize soil aggregation and water movement, while improving nutrient availability. When applied to the soil, this product improves the turf manager’s ability to “bump” sodium off the negative exchange sites and back into solution so it can be leached or flushed. Cal Fresh can be applied post flush, to deliver calcium, optimize soil aggregation and water movement, while improving nutrient availability. Cal Fresh is also readily absorbed as a foliar spray. 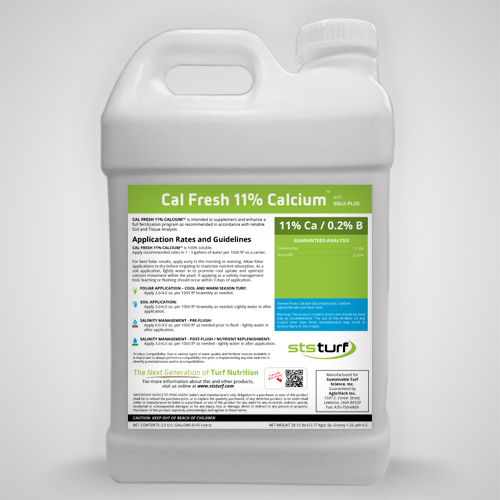 Cal Fresh with 11% Calcium incorporates two (2) sources of calcium, and also contains boron, which is often referred to as a “gate keeper” for calcium, improving uptake and translocation. Our high quality calcium sources are incorporated to optimize energy, signaling, cell development and integrity, promote root growth, aid in carbohydrate translocation, and nitrogen absorption. Highly effective as a foliar or a soil applied product. Apply as Foliar - or to Soil! Injection/Fertigation Rate / Acre 1.0 - 4.0 qts.